It was Ethan’s turn to choose the read aloud book. Little boy went rummaging through our home library and came back waving The Number Devil by Hans Magnus Enzensberger. Well, why not? I thought. So, in our tenth read aloud book, Math meets Reading Streak! I’m pretty sure E chose this book because he liked the pictures; he finds the little red guy with horns amusing. I was a bit skeptical about whether he could actually follow along. However, my rule of thumb is to talk math with them whenever they request it of me, so if the kid wanted to read “a mathematical adventure” and discuss it, then I’d be happy to oblige. I find the actual story line rather so-so. This boy, Robert, has reoccurring bad dreams about being swallowed by stinky fish or endlessly sliding, sliding down. Robert also hates math, or, more specifically, he hates the dull arithmetic algorithms he is forced to solve at school. One night, his string of bad dreams is broken by a visit from the little red number devil. Robert and the number devil embark on a series of 12 nights of dreams discussing what the number devil considers interesting basic mathematical concepts. I dunno… math… devil… dreams… the story around the math feels disjointed to me. However, the math part of the book is really interesting. The concept of infinity. The importance of zero. Prime numbers. Repeating decimals. Fibonacci sequence. Irrational numbers. Permutations. The idea of a proof. And lots more. There’s good meaty stuff with lots of potential for discussion and experimenting in this book. Currently, we’re working our way through the fourth night (chapter 4). It’s slow going because we’re approaching this read aloud with pencils, paper and calculators in hand. We frequently stop to verify calculations and to try to extrapolate before reading on. For example, does (11 x 11) = 121? Now check to see if (111 x 111) = 12,321? Who sees the pattern? How long do you think this can continue on? So far, both boys are enthusiastic about this interactive read aloud. Do they understand everything? Probably not. I’d say that Simon (9 1/2) is getting more out of this than Ethan (almost 7). But even so, he’s only absorbing a fraction of what these concepts mean. And even that, I’d guess, he will forget again shortly. Does this matter to me? No, not at all. I first introduced the Fibonacci sequence to Simon about 3-4 years ago. He got all excited about it. Then he forgot. It came up again in conversation a year or two later, I reintroduced him to it. He thought it was great. Then he forgot again. No big deal, because it took only a brief reminder to jolt his memory. This time, when I said Fibonacci & Ethan looked quizzically at me, Simon was the one to explain it to his brother. So overall? I like this book. I welcome the chance to talk math with the boys. And of course, it fulfills the reading requirements for our continued reading streak (day 93 today if anyone wants to know). Not to mention, I’m also learning and rethinking a few things myself. It’s been about 20 years since I earned my undergraduate degree in mathematics. Nowadays, I wishfully title myself “mommy-extraordinaire,” “crafter,” and “wanna-be-gardener.” But a long time ago, I studied to be a mathematician… and I guess there must still be a little part of her around because I felt all warm and fuzzy when I saw the words “elegant” and “proof” in one book together. So it was the little boy who picked this latest read aloud. But quite possibly, I’m the one who’s happiest to see our reading streak cross paths with all these neat mathematical ideas. Completed the first project in my introductory sewing class this week: a cotton 10×16 square inch drawstring bag. This little bag took about an hour to make. That included watching the instructor demonstrate each step first before doing it again myself. Measure. Cut. Press. Sew. Finish seams. Thread the drawstring through. Done. I liked the slow, methodical steps that started with a simple piece of fabric and resulted in something functional. Think I’d like to make more drawstring bags. Gift bags. Small organza ones with ribbon threaded through. Or how about red velvet drawstring bags sitting under the Christmas tree? Maybe velvet is too fancy. I think upcycled coffee bean burlap bags would look gorgeous under the tree as well. Yarn & craft project bags. I usually have 2 to 3 different crochet and knitting projects going on at once. Each project is stored in plastic ziplock baggies – neither aesthetically pleasing nor environmentally friendly. I’d make these bags in bright colored nylon. Shoe bags. That’s what Emily (sewing instructor) says she uses her drawstring bags for. Good idea. I would use Jin’s old button down work shirts to make shoe bags. Workout clothes bag. Need something water resistant to stuff sweaty gear in after working out. Nylon again? I think I have some old windbreakers that could be upcycled for this purpose. Drawstring backpack. Either in nylon or canvas. These would be for my boys. They need something to haul their sparring gear around in. Why buy giant duffel bags if I now know how to make a backpack? Looks like this week’s sewing lesson is going to come in real handy for me! Would you agree? And are you inspired to make a bag yet? From Skip to My Lou. Clear instructions for this basic bag. Uses pinking shears on the edges instead of finishing seams by sewing. From In Color Order. A little fancier. This tutorial shows you how to piece different fabrics together and how to make a lining for your bag. Gorgeous, detailed pictures. If you do decide to make a bag, then I wish you happy sewing! And if you have any more ideas for what we can use our drawstring bags for, I’d love to hear from you. Next sewing project will be a zipper pouch (have I ever told you I have a fear of sewing zippers?). 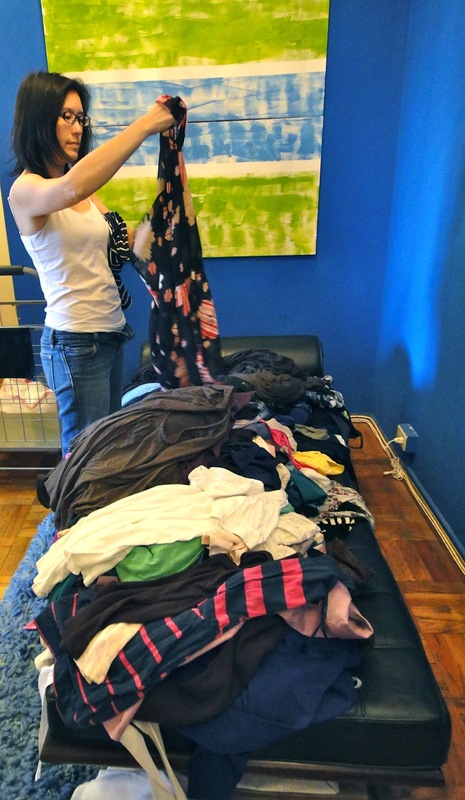 Who doesn’t have unwanted stuff cluttering up her closets? Such was my dilemma (yup, such a tough life) when I received an invitation to attend a clothing exchange party. What an awesome chance for me to dump off what I wasn’t using and perhaps pick up one or two “new” things for myself! In case you wondering what a clothing exchange is: The basic idea is that one woman’s unwanted apparel could become another woman’s new favorite thing. Shirts, pants, dresses, jackets, jewelry, scarves, purses and even shoes. Whatever. So long as it’s clean & in good condition. Each woman brings as much or as little as she would like to get rid of from her own closet. Then, during the party, everyone “shops” through the piles of clothes & takes whatever she likes. Doesn’t that sound like a fantastic, frugal & green way to have some fun? I’ve long wanted to attend one of these. I even considered setting one up, but never followed through because I was fretting over details like… What if no one brings any clothes to trade? How about if two people brawl over one outfit? Does it work like a white elephant party where one person gets to go at a time? Would that be too weird? And where are folks supposed change? What if all the other women are smaller than me…? All my worries were swept aside when my friend, Patty, hosted a fabulous clothing exchange party this weekend. All I had to do was round up unused items from my closet & then show up, eat, chat, “shop” and enjoy! 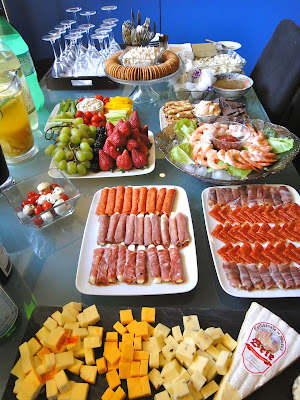 Here’s the spread Patty prepared for the 9 of us trading clothes. Pretty impressive looking, huh? Perfect finger foods to snack on in between looking through piles of clothing. We sorted & stacked clothes out by type. Dresses and shirts in this pile. Everyone “shopped” at once and let each other know when something looked really good (or really bad). I felt a little hesitant at first. Walking into the party, I knew only Patty. But 3 glasses of sangria and some good laughs over a few of the outfits later (what was that – streetwalker chic? ), I was having a blast! In the end, it didn’t matter that we weren’t all the same size. Every woman found at least one “new” item to take home with her. We “shopped” side by side. When two people liked the same item, whoever found it first had first dibs on it (perhaps my concern about brawling was a little farfetched). Here’s what I brought home from the party. Two adorable fall jackets. A simple little black dress. Brand new flats. A handful of bright blouses and scarves – still deciding if I want to wear them or use them to craft with. And a gorgeous olive wrap sarong/skirt. Love it all. And the best part is, when I’m done with these clothes, they can just go back in the pot for the next clothing exchange. The clothing exchange party. Made new friends. Cleaned out my own junk. Rummaged and shopped for free. And in the end, we donated excess bags to others who could use it. Really wonderful fun. Thank you Patty! I’m learning to really sew! I’ve plugged myself into an eight session introductory class at The Sewing Studio. Two lessons completed so far. Six more to go. Bright, pretty and functional space. Bubbly, helpful, clear and patient instructor. Having a lot of fun learning the fundamentals of sewing. I want to conquer my fear of zippers, make button holes, work with corduroy… actually, let’s make that work with leather. I want to make lined tote bags with snaps, zippers and fancy finishes. Coin purses too. And little zipper pencil cases from laminated fabrics. I want to figure out how to set up a serger and then make glorious, impressive, can’t-tell-it-was-homemade stuff with it. Would love to experiment with heavy felt – maybe make some soft crates and baskets. A parade of possible projects march about in my head. Add to that the materials folks have been donating my way. Friends heard my crafting efforts were moving in the direction upcycling projects, so they’ve started dropping off unwanted scarves, ties, belts, clothes and even piles of fabric. Thank you to everyone. I will find a way use it all… but first things first… need those technical sewing skills… and the first step to that, is the current introductory class. We practiced on scraps of muslin in our first two classes. Basting. Top stitch. Edge stitch. All three still just straight lines – but each with it’s own purpose. Stay stitch. Sewn along a curved edge. My first attempt was such a sad, raggedly looking curve. Making a gather. Finishing a seam with a zigzag stitch. Finishing a seam with a serger… ahhh… the serger… love that thing. We’re making a drawstring bag next. Then a zippered pouch. And finishing the class by sewing a skirt with waistband and zipper. I’m really looking forward the upcoming lessons. I’ll share the projects with you as I complete them. Fingers crossed that results will be decent. Fingers and toes crossed that I’ll actually want to wear that skirt when I finish it. Well, successful class results or not, at least every lesson will get me one step closer to making that list of projects dancing around in my mind. Can’t hardly wait to start tackling those! E & I have been rereading many of our old picture books from our home library. 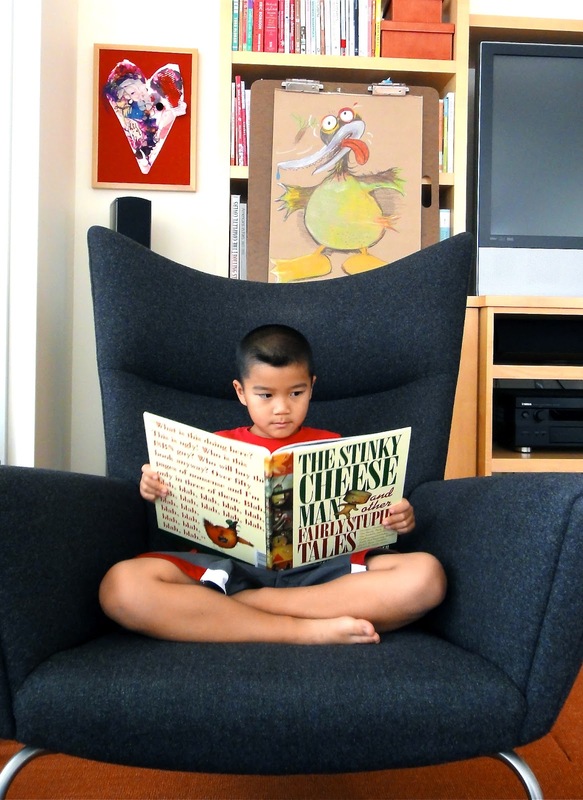 One of my all time favorites is The Stinky Cheese Man and other Fairly Stupid Tales by Jon Scieska and Lane Smith. Entertaining. Silly. Obnoxious. Downright hilarious punchlines. Ethan had forgotten all about this particular book. When I read this to him, he giggled non-stop through the entire thing. As soon as I finished reading, he picked the book up and read it back to me. 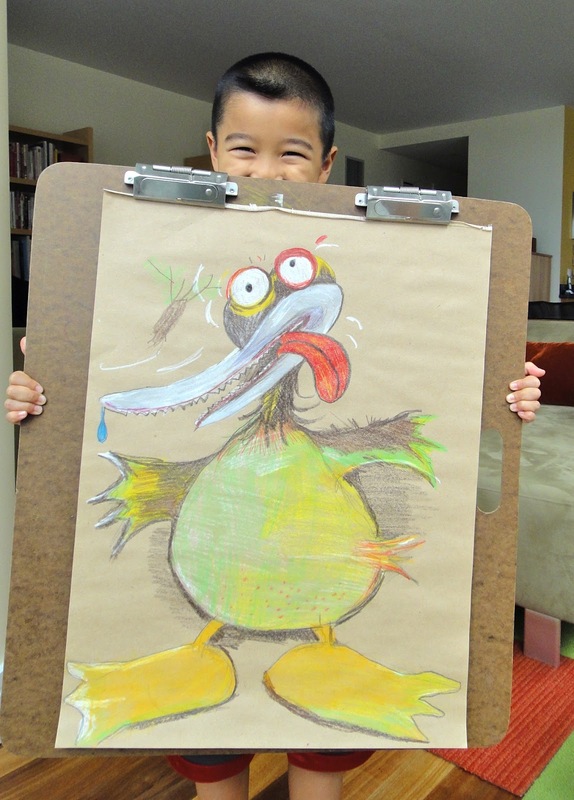 His favorite was The Really Ugly Duckling. E loved the story so much that we decided to draw and color the really ugly duckling for ourselves. I also convinced E to read the story one more time for the camera. This video cracks me up, warms my heart and never fails to bring a smile to my face. I hope you enjoy it too!